The Valley is experiencing a condominium and townhome boom with new projects that are on the drawing board or ready for grand openings at every turn. Here are ^ve things to consider before picking out your new home. 1 Location. Do you want to walk out your door and hop on light rail? Or bike to dinner with friends? What’s the things-todo quotient of the area? You will want to consider whether a property matches your lifestyle — and that means taking a look at location. If being in the “middle of it all” matters, think about whether the area is up-and-coming or one that is established with restaurants, shops and activities that are important in your daily life, said Paul Williamson, principal with True Craft Residential, developer of the Novella at Arcadia townhome project in Phoenix. Walkability is also a driving force in many of today’s condo and townhome properties which often tout close proximity to restaurants, bars, shops, public transit, entertainment and more. Liv URBN’s Contour on Campbell, for instance, is a short walk or bike ride to restaurants, grocery stores and shops. 2 Construction. ae type of construction can impact a property’s long-term stability, how a property holds its value, how much noise residents will hear from their neighbors and more, said Scott Fisher, principal with Liv URBN, which also is developing The Mason townhouse project in Phoenix. Construction costs are higher with concrete — which translates into higher purchase prices for buyers — but Fisher believes that concrete offers stability and value in the long run. First-time buyers should not only think about their entry-point purchase but how the home will hold up in the resale market, Fisher [of Liv URBN] said. 3 Amenities. Newer condo and townhome projects are loaded with amenities — everything from rooftop gathering spaces to pet-washing stations to fabulously appointed fitness centers. 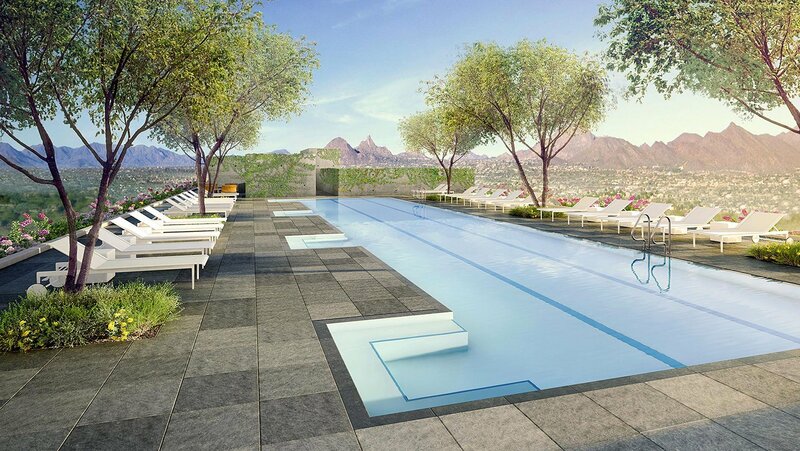 Properties may also offer technology packages which might include basics like poolside wi-fi connectivity or more involved smart-tech inside your home, said Crel Vogel, regional sales manager for Polaris Pacific, which oversees sales for Contour on Campbell and also Optima Kierland in Scottsdale. 4 HOA. Pretty much all condominium and townhome properties will have HOAs to manage maintenance and upkeep of the property. Ask about monthly HOA dues and what those dues cover. Dues run the gamut and should match the level of amenities to ensure the association is planning for future needs. Williamson [of True Craft Residential] said buyers can also ask for an HOA’s reserve study, a long-range capital budget planning tool that helps guide associations. Buyers should know that HOA dues can impact financing since the dues will be factored into debt-to-income ratios and may affect the amount a buyer can borrow. 5 Parking. Parking options can range from surface lots to underground garages to private garages. If you are considering a property with communal parking, ask about the number of spaces allotted to each unit and whether those spaces are assigned to individual units. Also ask about the availability of guest parking.